I recently read two books on speaking and thought I’d review them together. TJ Walker’s Secret to Foolproof Presentations was sent to me by the Jess Todtfeld, complete with a sticker that says, “Autographed by the author.” My understanding is that Jess and TJ are partners and the book cover includes “with Jess Todtfeld” under TJ Walker’s name. Jess asked if I’d be willing to review the book. I said yes, so he sent it to me. Confessions of a Public Speaker by Scott Berkun simply arrived in the mail a couple of months ago. No e-mail, no note, nothing. But I was traveling to my parents’ house, so I took it along. Both books contain valuable information, but they couldn’t be more different in tone and approach. But in the end, most good advice on speaking is pretty similar, so there’s a lot of overlap in content. TJ Walker teaches presentation skills classes and to some extent the book is an advertisement for his business. He also does a clever thing: at the end of each chapter, he invites you to his site to get more information on the topic. This requires registering, so he’s also building his e-mail list. That is a great marketing idea and I must admit I’m jealous. In the Introduction, he gives away is one big secret to giving a foolproof presentation: “Develop an audience-focused perspective rather than a speaker-focused perspective.” Then he explains that the way to find out what the audience wants to hear, whether your slides work, and so on is to simply ask them. What is the best way for me to start my presentations? 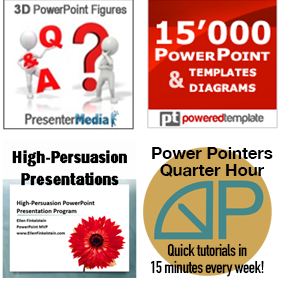 Should I use PowerPoint or other technology to enhance my presentation? How do I get rid of my “ums” and “uhs”? TJ is big on finding a way to become more memorable, that is, making sure your audience remembers what you said. He’s mostly talking about business presentations that are meant to persuade an audience. He talks a lot about sales presentations. The book is a quick read and contains lots of useful advice for people who need to give effective presentations, that is, presentations that have the desired effect on the audience. And TJ and Jess are great marketers! I’ve never heard of Scott Berkun. I’m not too clear on what he talks about; I think he talks about learning and creativity. He’s done some training as well. He also has an interesting marketing technique: at the end of the book, he asks readers to review it on Amazon, write about the book in their blog (which I’m doing now), recommend the book, go to his web site, etc. Why don’t I think of these things? But the tone of his book is very different. Scott thinks of himself as a thinker and that shows. The tone was much more personal. I found some of the stories boring, but he has some unique insights that seem to have come from reflecting on his own experience. Nevertheless, he has read a lot on the topic of speaking and shares quotes from other books. The title of your talk is important. The author gives lots of examples and tips for creating a title that will get people interested, actually communicate something, and even ehlp you construct the rest of your talk. It’s OK to use a simple outline or short list (but you probably shouldn’t write it on your hand). No, he didn’t say that last part. There’s a lot more in the book, so I recommend that you read it, especially if you do public speaking.